This ain't your standard supernova. 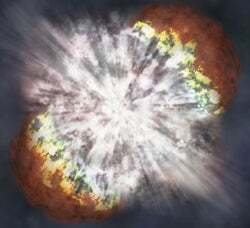 A while ago, astronomers noticed an exploding star that was about 50 to 100 times brighter than normal. Here's why: It was freakin' huge. After two years of studying light output from the star's death, one scientist is proposing that this star might have been the biggest ever known. About 200 times larger than a standard solar mass. But in the case of an extremely massive star, while its core is still made of oxygen, it releases photons that are so energetic, they create pairs of electrons and their anti-matter opposites, positrons. When the matter and antimatter meet, they annihilate each other. Electrons and positrons? Matter and anti-matter? All fighting to annihilate each other and creating what may be the biggest nuclear explosion EVER? Man that sounds awesome.